Akitu (Akītum; Sumerian ezen á-ki-tum) means ‘head of the year was a spring festival celebrated in ancient Mesopotamia. The name is equivalent to “barley” in sumerian, originally marking two festivals celebrating the beginning of each of the two half-years of the Sumerian calendar, marking the sowing of barley in autumn and the cutting of barley in spring. 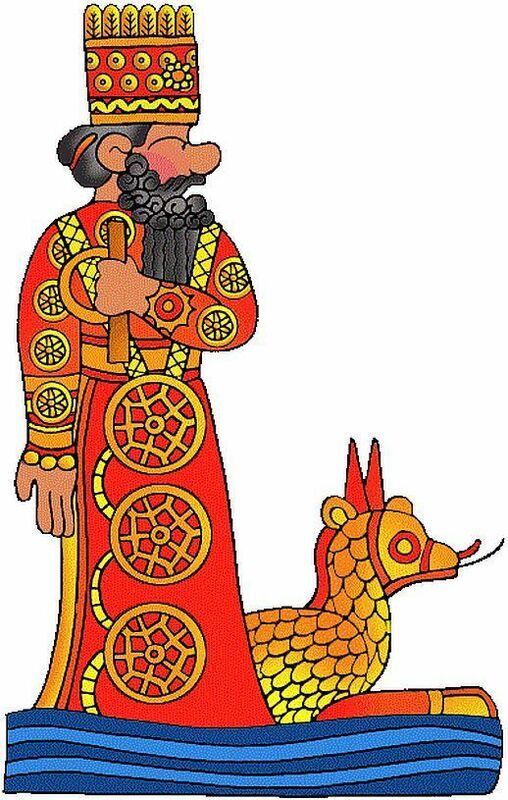 This Ancient Babylonian Akitu Festival started in its religion to be dedicated to Marduk’s victory over Tiamat. During this 11 day festival the statues were cleaned and received new dresses. On the next day, the festival reached its climax when all statues were brought out from their rooms and shown to the Babylonian populace. The gods started a tour through the city to the river. They boarded a small fleet, that brought them to the house of the New year. The king himself guided the Supreme God Marduk, (who rests upon a winged serpent [Garuda-Ananta ?]). On the last part of the route, the ships were placed on chariots, so that the gods were driven to the house of the New year. This festival was called Akitu by the ancient Babylonians and continued for centuries not only in Babylon but in Palmyra and the temple of Baal was inaugurated on the same date as Akitu. At the beginning of the third century AD , it was still celebRated in Emessa in Syria, to honor the god Elagabal; the Roman emperor Heliogabalus (218-222) even introduced the festival in Italy. A very similar festival is celebrated annually in Puri, Odisha in East coast of India. It is the annual Jagannath Ratha Yatra Festival in which hundreds of thousands of people gather to celebrate and honor Lord Jagannath (Krishna), Subhadra (Krishna’s sister) and Balabhadra (Krishna’s elder brother Balarama). As part of Ratha Jatra, the deities of Lord Puri Jagannath, Lord Balabhadra and Subhadra are taken out in a procession to Gundicha Temple and remain there for nine days. Then the deities or Ratha Jatra return to Puri Jagannath temple. It is interesting to note that Krishna constructed a city of Dwaraka and its has same meaning as Babylon. Dwarka means “gateway to the Supreme” or “city of gates” and Babylon was called Babilli in early 2nd millennium BC, meaning “Gate of God” or “Gateway of the God.“. But in countries or places like Babylon, Egypt, Peru, Greece or Mexico, ancient civilization slowly perished and european or american lifestyle tookover. Only in India, ancient civilization continues till date. In Puri, everyone comes together to pull the statue of the Gods through the streets pulling it along with its massive ropes. The hectic bustle of the carnival route in Puri is a modern reflection of the ancient rituals 2,500 years ago in Babylon.